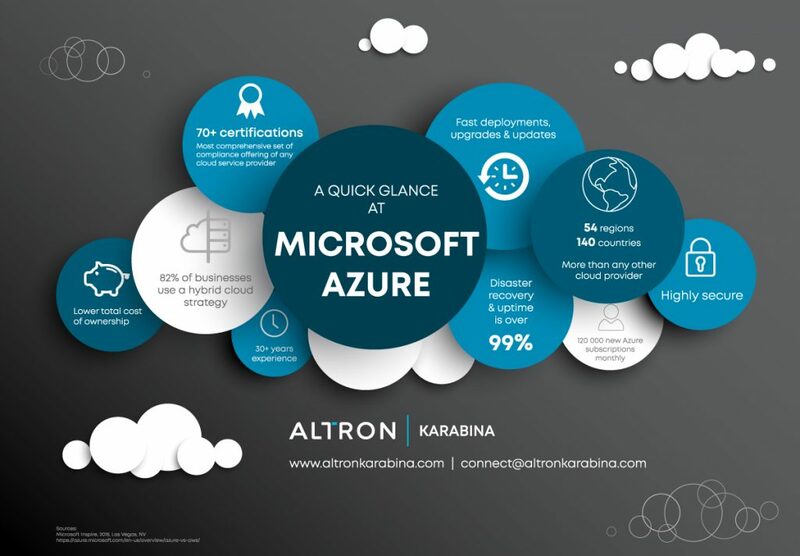 Altron Karabina can migrate your on-premises solutions into the Azure cloud, including databases, legacy applications and/or homegrown systems. Many organisations are running business critical systems on their own hardware or in a data centre that they are responsible for. Without these systems, organisations are unable to operate. If these systems are unreliable or unavailable, or the hardware is aging, it is highly detrimental to the business’ success. With aging hardware and shrinking budgets, the cost of replacing hardware is high. On average, internally managed business-critical environments are only available 85% of the time. Typically your workloads for business critical systems are required at the beginning/end of the month. This is when your servers tend to go down. It is for this and many other reasons that organisations are opting to migrate to the cloud. WHY MOVE TO THE AZURE CLOUD? Our Apps team will enable your DevOps processes, modernise your applications and create robust integration between applications. Our Infrastructure team enables the modernisation of your infrastructure and hardware though assessing your ability to move to Microsoft Azure, plan and execute the move, and monitors the costs and utilisation of the cloud platform. The Performance and Productivity: Your Guide to Managing Cloud Sprawl e-book will help you rethink your approach to managing multiple cloud services by adopting an intelligent, holistic solution to secure and control your cloud resources. As a Microsoft Gold partner, we’re specialised in Microsoft solutions and have developed our own agile approach to provide quick time to value to customers. We can migrate your on-premise solutions into the Azure cloud, including databases, legacy applications and/or homegrown systems. We’ll help you to be up and running quickly with a scalable, cost effective solution that works with your existing investments.